Striking filly Meidung split future Group 1 winners Nechita and Dear Demi in the Group 3 Silver Shadow Stakes at Warwick Farm back in August and she looked a Group 1 filly in the making herself with a dazzling last to first performance in Saturday's Listed Twilight Glow Stakes (1400m) at Sportingbet Park – Sandown Hillside. Patiently ridden by Kerrin McEvoy came with a barnstorming finish to defeat the Peter Moody-trained Kukla by three-quarters of a length with Thunder Rain one and three-quarter lengths back in third. 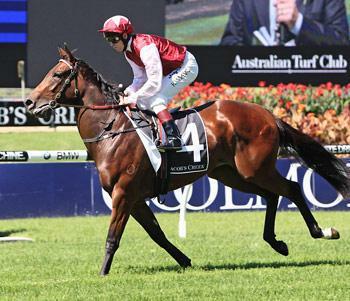 Trainer Peter Snowden said the daughter of Bernardini needs time to find her feet. "That's how she races best," Snowden said. "She's got a tremendous turn of foot but quite often, she's her own worst enemy. She's got this bad head carriage, which doesn't help. "If you can get her to switch off, right off, in a race, she has got this tremendous turn of foot." It was a welcome change of luck for Meidung who opened her winning account at the first time of asking but has been winless in 7 start since although she has placed in four of those. The Darley homebred is the fifth foal of the Sydney winning Canny Lad mare Amish, a half-sister to the admirably consistent Darley colour-bearer Pinwheel (Lonhro) a dual Group 2 winner of over $1 million. Meidung (pictured) becomes the 19th stakes-winner worldwide for her sire Bernardini (USA) and the fourth in the southern hemisphere. Bernardini's service fee was recently raised to $150,000 US. Delbridge Racing has a promising staying type by Bernardini named Bernzigova and there is one 10% share available at $12,100.